It is our goal to provide you with the highest quality plant material possible. 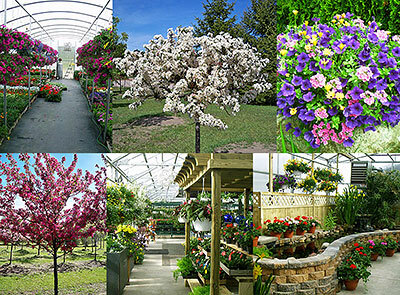 We stock our nursery with a wide variety of trees, shrubs, perennials, and annuals. All certified by the Michigan Department of Agriculture to be disease and insect free. Stop in so we can assist you with all of your landscape needs. As mentioned, we have the best varieties of plantings in your nursery. Our plantings are grown in a controlled and well-managed environment that ensures their health and proper growth. The plants are checked regularly by our plant experts for diseases and possible pest infestations. By following the industry's best practices, our clients are assured of best-quality plantings. Annuals. You can have a garden that blooms all year round with these annuals: Angelonia, Alyssum, Begonia, Cosmos, Flowering maple, Gazania, Geranium, Marigold, Viola, Petunia, Scaevola, and Zinnia. Perennials. Some of the annuals that we recommend for landscapes are tall garden phlox, Veronica, Sage, Asters, Purple coneflower, and peonies. Shrubs and Trees. Shrubs are great for creating beautiful topiaries in your garden while trees can provide shade and fruits. Some of the varieties that you may choose include maple, dogwood, redbud, chokeberry, buttonbush, barberry, boxwood, butterfly rose, arborvitae, and angel's trumpet. Grahek's, Inc. is a one-stop garden center. We make sure that we have the capabilities to provide our clients’ planting needs, whether they are DIY homeowners, property developers, or landscape contractors. They can also get other landscaping materials and supplies from us. And if you want hassle-free landscaping, you can hire us to install all the plantings in your landscape. We offer this service at a very reasonable rate. Call us at (231) 775-9362 for more details or visit our nursery at Cadillac to personally choose your plantings.